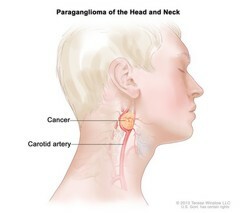 Paraganglioma of the head and neck; drawing shows a tumor near the carotid artery in the head and neck. Paraganglioma of the head and neck. A rare tumor that often forms near the carotid artery. It may also form along nerve pathways in the head and neck and in other parts of the body.